Compress the files for faster upload, using WinZip. Or you can mail us a CD. Special instructions for converting from ACT! Goldmine .EXE, .DLL, and .INI files. Below this folder you will see the GMBASE, Demo, Common, Mailbox, Reports, and your data folders. Everyone should be out of GoldMine for this to work because if a file is open by someone on your network, it will not compress some files, and I will not have all the data to convert. Which files do you need to convert? In Goldmine, you can select File, Open to see which folder it is looking in. Which database format do you use, SQL, FDB, or DBF ? There are 3 different formats for storing a Goldmine database, SQL (Structured Query Language) format, FDB (FireBird) or the more common DBF (Data Base File) format. Your database administrator should know. Or you can check under File, Preferences, Login. See if it mentions SQL. 1. The SQL format is designed for very large databases, on a server, with many users. 2. The FDB format is a new format, which is public domain, and can accommodate very large databases. 3. The DBF format is designed for small to medium sized databases, on desktops or laptops, with a small group of users. Which files should you send? 1. SQL Format: If you use Microsoft SQL Server or Oracle to store your Goldmine database, you only need to send 2 large files. These would be found on your server. Please do not send a GMB or other unnecessary files. In order to zip the file, you must take the database offline. 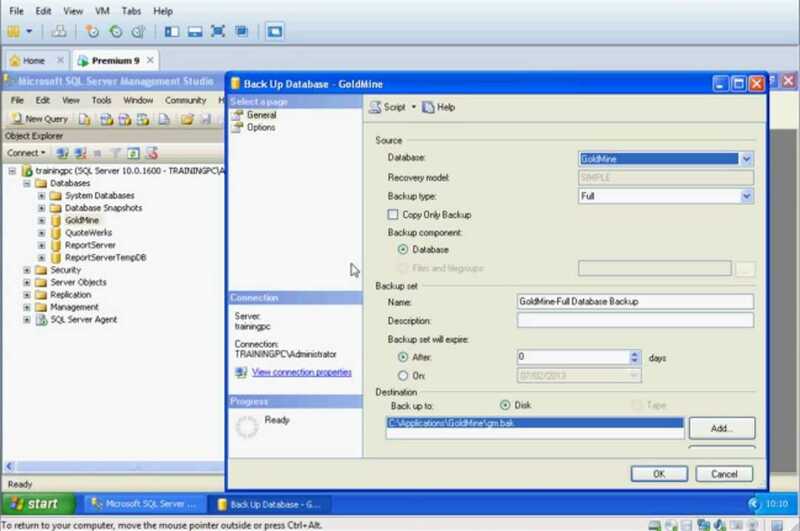 The MDF and MLF files are required, which can be included in the Goldmine Backup. Enter a location near the Add button. This folder may have been renamed from Common. Other folders like DEMO have these same file names. Check the dates and sizes to be sure they are the right ones. We don't NOT need the Goldmine software files, such as GMW5.EXE, or any DLLs. 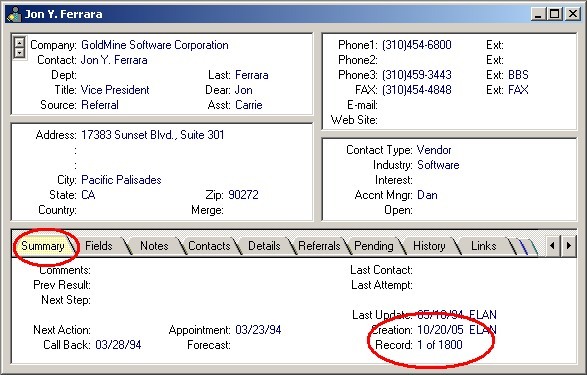 The files should have a recent date, indicating they contain your up to date data. 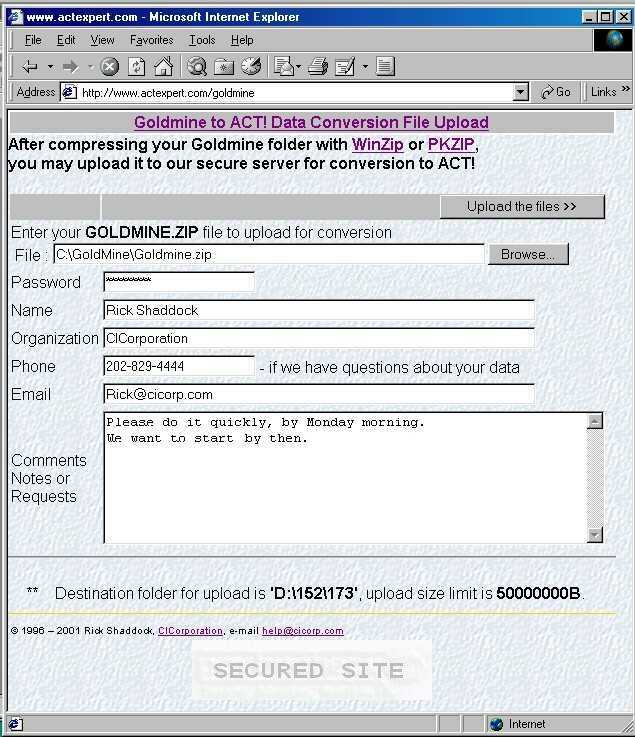 The GoldZip.Bat file, placed in the Goldmine EXE folder, will get the proper files automatically. Or, you can create a compressed "Zip" file on your own. Please do not send the \GOLDMINE\MAILBOX\ATTACH folder, as this may have hundreds of Word processing, Excel spreadsheet, and PowerPoint files. These do not need to be converted. 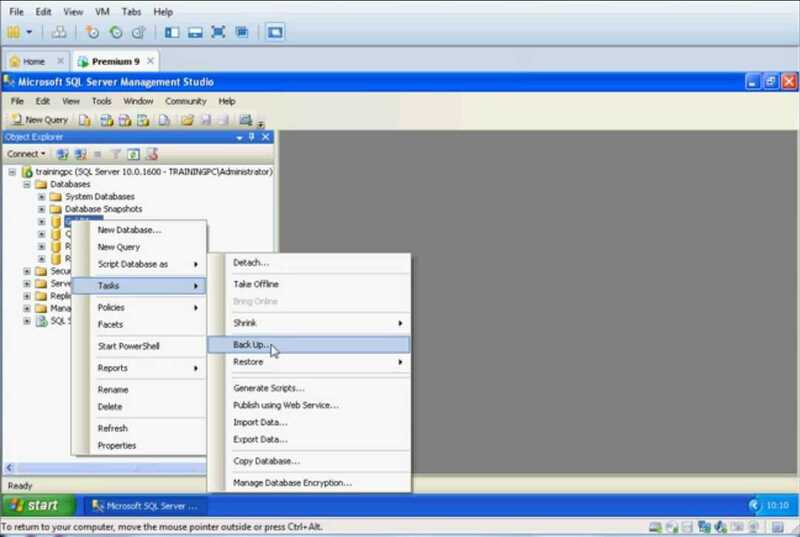 Just send the Zip file as an attachment using your email program. Large files (10 MB+) often do not transmit properly, if at all, through email. Some organizations have a limit on the size of attachments you can email. We suggest using our web based drive, which offers you up to 100 Megabytes of online storage space. If your file is larger than that, give us a call at 800-DATA1OK, so we can send you the FTP settings to upload it directly using an FTP program such as CuteFTP. You can send it to our Anonymous FTP site. Enter your name, company, phone, and email, so we can contact you if there are any questions during the conversion. This will be the phone and email we will use to tell you when your data is ready. Please call us at 800-DATA1OK or 202-829-4444 to let us know you just uploaded the file. Converting from Goldmine DBF to SQL .